Protect America is your best bet for an inexpensive DIY system that expands over time. Protect America is a DIY system that you can customize over time. Read our review to learn more about prices, equipment, and cameras. If you want a home security system without paying a ton up front, Protect America can be a great way to go. In fact, staying within budget is easier with Protect America than with many brands because both installation and activation are free with DIY equipment. On top of that, the equipment has a lifetime warranty, so as long as you continue service with Protect America, your equipment will be replaced if damaged. Speaking of equipment, the company offers up to $1400 in free equipment (more on that later). But be warned: fire and smoke monitoring cost extra. If you’re looking for month-to-month security service, you’ll have to go elsewhere. Protect America offers 36-month contracts only, which means you have to pay a hefty cancellation fee if you bail early (so you may as well stick it out). Since it is a DIY system, you can take it with you—renters and buyers alike can use Protect America. Subscribe to our YouTube channel for more video reviews. If you’re familiar with home security, you may know that Alarm.com provides equipment and mobile app support for a lot of companies, including Protect America. While this may not be the most exciting system we’ve encountered, it’s familiar and easy to use. Protect America has a lifetime equipment warranty, one of the only home security companies we’ve reviewed to do so. The warranty covers all defective security equipment or damage caused by intruders, but it won’t cover abuse from the customer, so don’t try to get new equipment by smashing your old stuff. For most people, home security can be as simple as monitoring the access points of your home and having an alarm that notifies you or the central monitoring center. Beyond that, you’ll want to link all your smoke and heat detectors, carbon monoxide detectors, and flood sensors to the main system. These are sometimes referred to disaster sensors since they cover fire, gas, and water problems. We like that Protect America offers additional smoke monitoring, but we dislike that it costs an additional $10 per month. What types of security equipment does Protect America have? Protect America uses both the Simon XT and Simon XTi control panels. The difference is the XTi is a touchscreen, so it’s easier to tell what’s going on between it and your smartphone. You will need to purchase a Silver package ($49.99) or higher in order to get the touchscreen version for an additional one-time cost of $99. We’d say it’s better to go with a touchscreen control panel because it’s clearer to tell what’s going on from farther away, plus your in-home experience will more closely match your mobile experience. If you’re interested in adding smart home features to your home security system, Protect America can help you out. Home automation upgrades your ability to control your home. It works with Z-wave technology and the X10 standard, which are some of the most common way of linking home security products together. You shouldn’t have trouble finding compatible products. With Protect America, you’ll create IFTTT (If this, then that) scenes, meaning you’ll create triggering events. For example, you can trigger the lights in your living room and kitchen to turn on when you enter the front door. Or if you know everyone leaves the house by 8 a.m., then you can set an event scene that arms all of your locks at that time. We love the idea of alerting individuals with hearing impairment to alarms by turning on all of the lights—this could be a literal life-saver. Home automation simplifies a lot of your daily tasks into an ongoing, automatic process. Protect America is Z-Wave compatible, meaning you can expand with third-party equipment. We like the idea of automatic deadbolts, or the Ring doorbell camera, or the Nest thermostat. 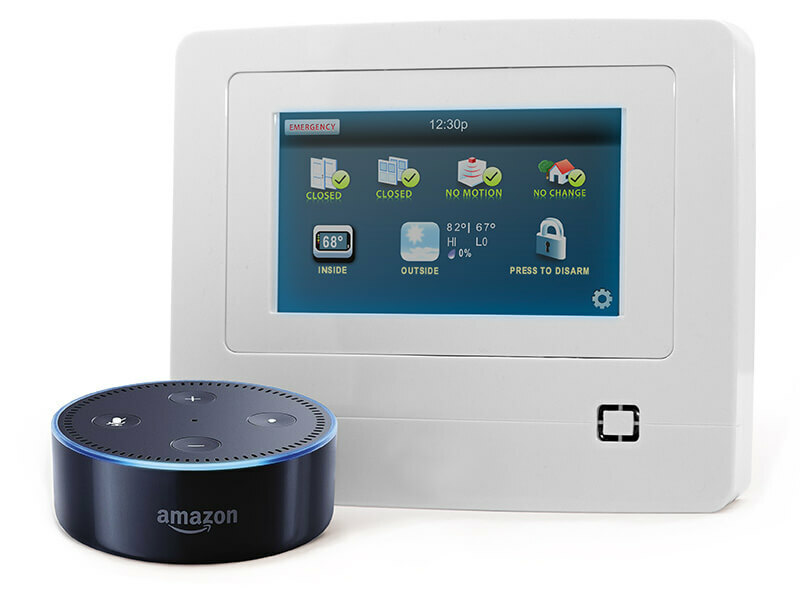 Whether it’s used to maximize comfort, security, or savings, home automation is a great feature, and Protect America integrates a wide variety of equipment using Z-Wave, x10 integration, and Amazon Alexa functions. One of our favorite features of this futuristic tech is the ability to control everything in your home remotely. Imagine setting your home’s thermostat to the perfect temperature before leaving work or automating your house lights to turn off 30 seconds after the kids take off for school. Protect America’s smartphone app is called SMART Connect. You can get complete system control from iOS and Android smartphone apps. 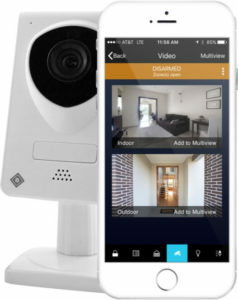 It makes your mobile devices a remote control for your security system, home automation, energy management, and live video. You get all of your security commands, and you can get email and text notifications for triggered events. As usual, we like that the app allows us to be our lazy selves and turn on and off our lights while we stay cozy under the blankets on the couch. In our experience, the app is about what we’ve come to expect—a bit buggy. The notifications and arming/disarming worked for us, but some users complained about it. However, the app froze multiple times while trying to connect to the stream, which is something we’re hoping Protect America (and every other video app) improves over time. Protect America’s camera sets up quickly—you just plug them into the power supply and install them through the app. You access your live feed is through the interactive platform. You can access the recordings from anywhere with cloud storage. The camera’s best feature is two-way audio, so you can talk to your family and hear back too. This is helpful for more than security issues. For instance, holler at your kids to check the fridge to see if you’re stocked up on berries or need to grab some more of those sweet treats. The cameras shoot in 720p HD at 25 frames per second (fps). The 60-degree field of view is great for corners, but you should be mindful of your framing when placing it in the middle of the room. Always double-check to see if you’re seeing every part of the room you need to. The cameras also have night vision for up to 16 feet ahead. That way you’re covered during the day and night. With the cameras, you can livestream from iOS or Android smart devices. Good news for those worried about hackers: Protect America uses 128-bit AES, which is “one of the most secure encryption methods used in most modern encryption algorithms and technologies. 128-bit encryption is considered to be logically unbreakable,” according to Techopedia1. All of your incoming and outgoing data is encrypted, so until it reaches the security sensor, no one else can mess with it. Installation and activation are free, and your included equipment is determined by your choice of the five service plans. Protect America also provides the following delivery options for each service plan: landline, broadband, and cellular. That means there’s a total of 15 plans, which may be a bit too confusing for most people. Broadband and cellular cost the same price with Protect America, so we’d recommend cellular for a more reliable system with less risk of outside interference or internet disruption. Landline uses your phone line, which is cheaper but runs the risk of intruders cutting the line. Also, with landline plans, you can’t get home automation or video like you can with a broadband or cellular plan. You also don’t have smartphone access with landline plans. Broadband means cable delivery, like with your TV. It’s more reliable than a landline, but still runs the risk of a line getting cut. You’ll notice that prices for broadband and cellular are the same, in which case we strongly recommend cellular. Cellular is the superior delivery method because it pings nearby cell towers and runs much less risk of outside interference. If you want to cancel, you must do so within three days after signing up to get all of your money back. You can still cancel within 15 days to get out of your equipment and contractual costs but not your first month’s monitoring service costs. Protect America does not charge a restocking fee for equipment. Since Protect America offers do-it-yourself (DIY) installation, you won’t have to pay for a technician to come out to your house. You also won’t have to pay activation fees, so up-front costs aren’t bad at all. Protect America’s installation instructions are clear enough on their own, but you won’t have to do it alone if you don’t want to. You’ll be guided and tested by a professional over the phone, which eased our worries of messing it up or leaving the process incomplete. Most users report that it took less than an hour to install. Protect America has straightforward 24/7 professional monitoring: an event is triggered, and the security center responds by trying to contact you or other given numbers first, then determines the appropriate first responders to contact. Protect America has “triple redundant monitoring stations” which means you’re protected not just by one center, but three at any given time. Even if for some reason one monitoring station can’t connect to your system or there’s a communication cut off, the other two stations will receive the same information. If you’re trying to get home security started without spending a ton of money up front, Protect America is one of the best bets out there. Plans start as low as $19.99 a month for essential landline monitoring (windows and doors), and it can expand up depending on desired equipment and delivery method. Basically, with each upgrade, you get an extra three sensors. But bear in mind you must have a Silver plan or higher to get smartphone and video access. Each type of plan (Copper, Bronze, Silver, Gold, or Platinum) has the additional option of landline, broadband, or cellular monitoring. We think this is a bit overcomplicated, but to the company’s credit, this gives users a lot of options in a wide price range. A few caveats: You must choose a broadband or cellular plan to get home automation and video features—and you must choose a Silver plan or higher to get a touchscreen control panel. Other than that, you pretty much get the same services from each level of plan—you just get more equipment with higher-level plans. Perhaps the biggest shocker when it comes to pricing is the extra $10 a month for fire monitoring. Fire is one of the biggest concerns in home security, and fire protection is required by many insurance companies for a home security service discount. This is perhaps the strangest drawback of Protect America—most companies include it for free. On the plus side, Protect America does have a price match guarantee. Also, if you want video monitoring, be aware that it runs $10 a month on top of your plan’s price. This makes more sense to us because video is usually the most expensive part of home security systems. Protect America has a 36-month contract (three years), and it doesn’t offer month-to-month contracts until after you’ve completed your 36-month contract. If you choose to leave your contract prior to the end of the term, you’ll have to pay the remaining balance—including all of the equipment you got from the company for free. Basically, if you want to cancel, see if you can remove any extra features you don’t use to reduce costs. It’s better to do that than cancel the service altogether and pay all that money at once. The other option is a transfer option that allows you to shift ownership of the equipment and service contract to a qualified person. If you have a friend who’s moving into a new spot or someone who’s been thinking about getting their own security system, this could be a win for both of you. 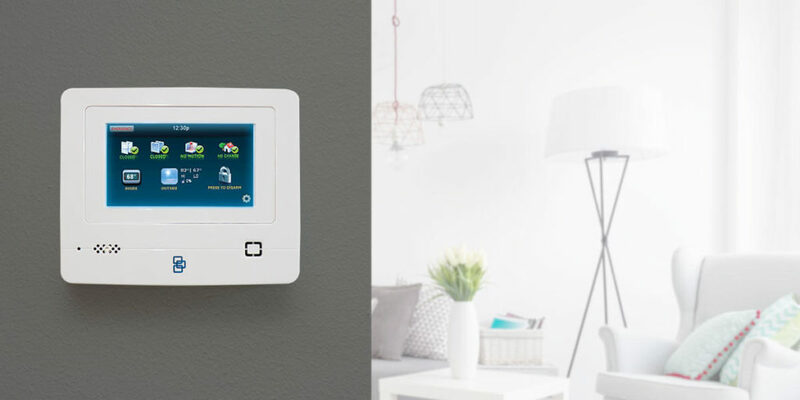 Free equipment and no up-front fees make Protect America’s DIY system great for basic security, plus it expands to video and home automation, too. Just because it’s DIY doesn’t mean it can’t be full-fledged: you can start basic and upgrade your system to include home automation and video surveillance later. Protect America is unique in vehicle tracking, which we haven’t come across with other companies. Aside from that, benefits we see in Protect America include the price match guarantee (which prevents buyer’s remorse) and the equipment lifetime guarantee, which ensures that as long as you’re a customer, you’ll get replacement equipment as necessary. 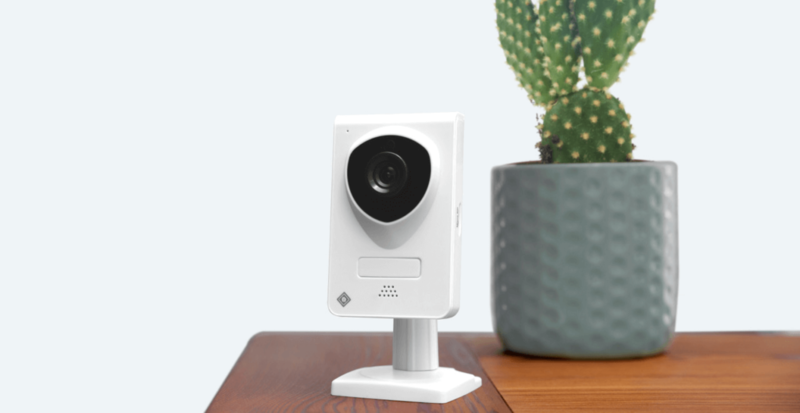 If you’re not convinced that Protect America is the right system for you, check out our review of the best home security systems on the market or read how the company fares when it goes head-to-head with Livewatch’s system. Protect America does basic security, home automation, and video surveillance. Protect America uses phone line, broadband cable line, or cellular service. Protect America provides replacement equipment for life as long as you’re a customer. Protect America does not charge installation or activation fees. Protect America requires a 36-month contract. Protect America has video surveillance starting at Silver plan and above. Protect America requires cellular or broadband service for home automation and video. Protect America’s Smart Connect app works for iOS and Android. Protect America has a unique vehicle tracking feature. Protect America’s sensors are pet friendly up to 40 pounds. If our FAQ doesn’t answer your question, ask below in the comments! Why should I get a cellular system over a wired system? Cellular is always recommended over landlines and cable because a smart intruder can potentially cut a wire to disable your system otherwise. We would say with Protect America, you should go cellular if it’s within your budget because you can expand to video surveillance, whereas you cannot with a landline. Cable has video access as well. Does Protect America do a credit check? Nearly every security company does a credit check, and Protect America is no exception. You’re fine. Your control panel will run off of battery life. Can I check my Protect America alarm system remotely? Yes, with the SMART Connect app, you’ll be able to check on your status anywhere you have an internet signal. Do I need to know how big my house is? Not necessarily. It’s better to get a phone consultation than guess at what package you need, anyway. Does Protect America have a moving or relocation discount? Since Protect America is a DIY installation, you can get a free moving kit, which makes it as easy as can be. Is Protect America pet friendly? Yes, Protect America has pet-immune sensors that won’t detect animals up to 40 pounds. You won’t get false alarms for your little buds running around. If you have pets over 40 pounds, consider opting for glass-break sensors instead of motion detectors.